For whatever reason, I was seized by the urge to try drawing. I was browsing in a Times bookstore, and I happened on this drawing kit. 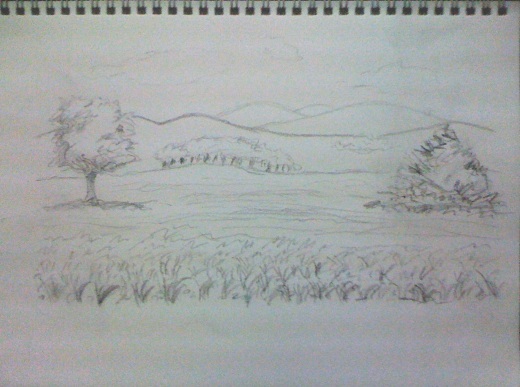 It consisted of a CD of about an hour of an artist teaching you how to draw. There’s also an instruction book for you to follow along. That was interesting. But I didn’t buy that. After a couple more visits to the bookstore, I finally searched more on learning artwork. 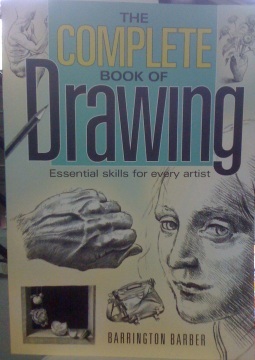 And I found a huge thick book by Barrington Barber, called The Complete Book of Drawing (Amazon affiliate link). After some self debating, I decided to buy that book instead. After flipping through a few pages, I sense I’m going on an awesome adventure. 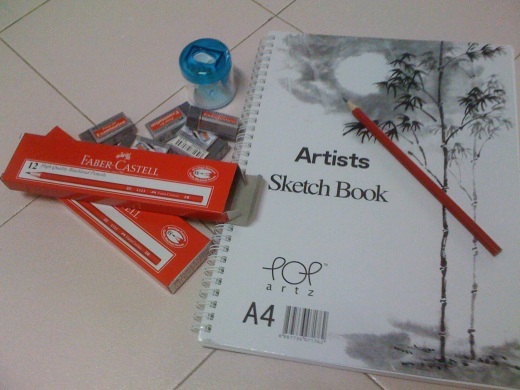 And then I went out to buy some minimal art supplies. 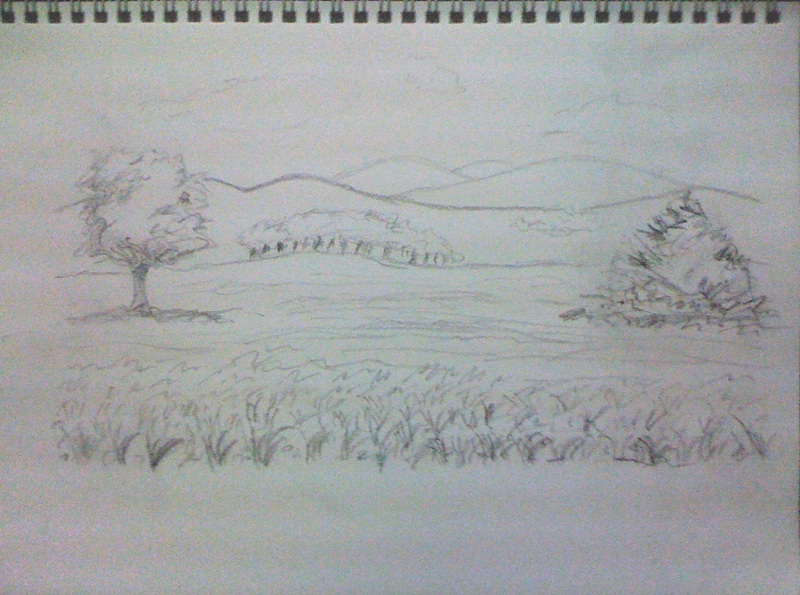 I think I’m better at landscapes. I wrote an article to convert a 360 degree fisheye image to a landscape view some time ago. I also realised I didn’t explain the math very much, mainly because I thought it’s fairly obvious. On hindsight, it doesn’t seem obvious. My apologies. Commenter Eric pointed out a math technique called linear fractional transformation. It’s basically a function that can map lines and circles to lines or circles. My postulate is that, the fisheye-landscape conversion has an edge condition that maps a line to a point. Specifically, the bottom of the destination image maps to one point, the centre of the source image. Thus linear fractional transformation is probably not suitable. I’m happy to hear from you if you’ve found a way to make it work. I have assumed a source image that’s square (width equals height) and its width has an even number of pixels. With this, let the given image be of width and height of 2l pixels. The idea is to construct an image with width of 4l pixels and height of l pixels, which is the landscape view of the source fisheye image. The dimensions of the destination image was arbitrarily chosen. I just find that a height of l pixels (or half the height of the source image) to be convenient. The centre of the source image is assumed to be the centre of the small “planet”. This means the pixels along the horizontal and vertical bisectors of the source image will not be distorted (much) by the conversion. You should know that only the pixels in the inscribed circle of the source image would be in the destination image. This is due to the “uncurling” effect. The pixels not in the inscribed circle would be out of range in the destination image. So, imagine the source image as a representation of the Cartesian plane. 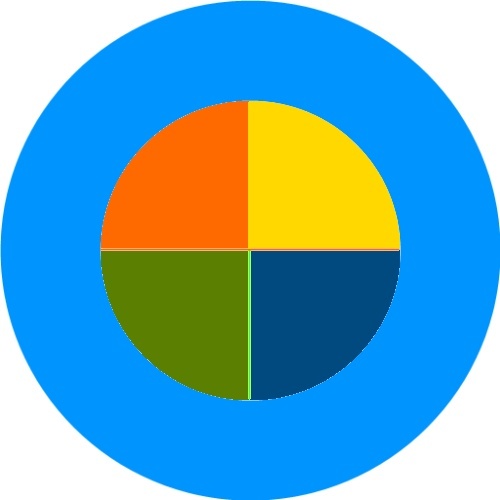 The centre of the image is the origin. The point A, is the eastern point of the inscribed circle. Points B, C and D are the northern, western and southern points of the inscribed circle respectively. What you should understand now is this: the pixels along the top of the destination image come from the pixels along the circumference of the inscribed circle on the source image. We’ll be iterating over the destination image (remember my messy index preference?) Let’s start at the top left corner. We’ll be iterating 4l pixels to the top right corner. This is visualised as going clockwise on the source image from point A, to D, to C, to B and back to A. So, 4l pixels is equivalent to 2 PI radians? where x is the Cartesian x axis. 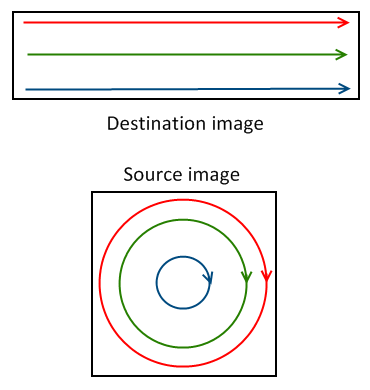 Generally speaking, iterating from the left to right on the destination image is equivalent to going clockwise on the source image. where y is the Cartesian y axis. 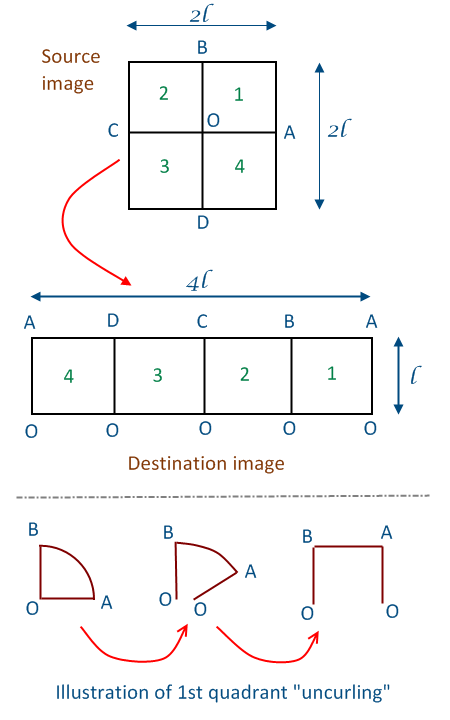 Generally speaking, iterating from the top to bottom of the destination image is equivalent to going from edge of source image to centre of source image. And once you understand that, the rest is just coding. I merged the code for converting Cartesian to raster coordinates together (more details here with code here). The code was deliberately left unoptimised so it’s easier to read. to save on operations. But the 2.0 * Math.PI makes it more meaningful. could have had the (2 * l) part assigned to a variable to avoid multiplication multiple times. You're welcome to use a variable perhaps named iSourceWidth for example. And that's all I have. I hope you have fun with the code. In this article, you will learn how to flatten a 360 degree fisheye image back to its landscape panoramic form. 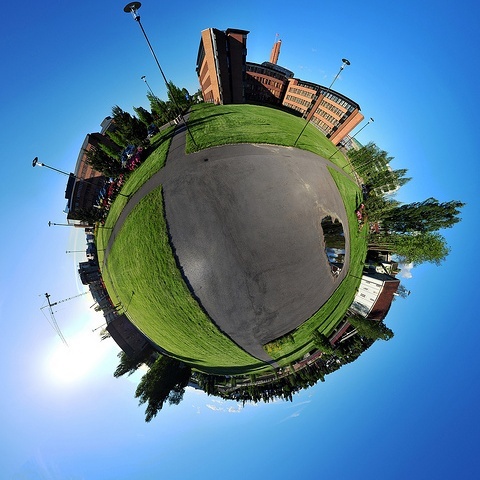 But first, what’s a 360 degree fisheye image? It’s created by using fisheye lens in your camera, take a bunch of pictures using that, and use stereographic projection to get the final image. Or so I understand. Basically, it’s like taking a normal (but panoramic is better) picture and “curling” it along its bottom or top (but much more complicated than that). Here’s how to visualise the fisheye image. Hold your right hand, palm downwards, in front of you, thumb towards you, little finger away from you. The tips of your fingers form the “left end” of the image. Your wrist forms the “right end” of the image. Now form a fist with your right hand. There’s your fisheye image. You may have noticed that the corners of the source image will not be in the resulting image. You may also notice that the centre of the source image is very “squeezed”, and the pixels around there will be repeated in the resulting image. The first problem can be solved by using a bigger destination image. But it doesn’t matter to me, and you will get a jagged top with unfilled pixels. I didn’t like that, so decided to give those up. The second problem… I don’t know if there’s a solution. Because you’re trying to “guess” the pixels mapped in the destination image from the source image. But the source image has less pixel information. 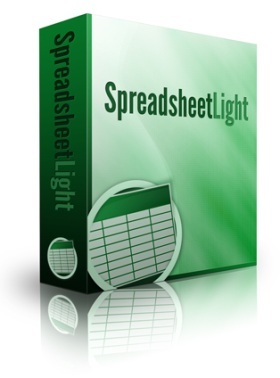 The simplest solution seems to be to get a higher resolution source image. But that only mitigate the problem, not solve it. What happens when circles are involved? Radius and angles, that’s what. So in the destination image, in raster coordinates, going from top to bottom is equivalent to going from outer inscribed circle of source image to centre of source image. 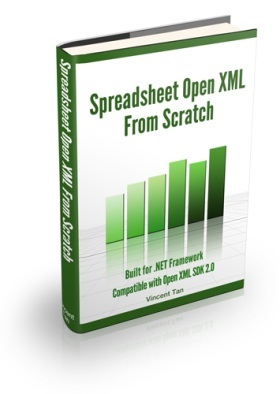 Or the variable l slowly reduces to zero. Going from left to right is equivalent to going from 2PI radians and decreasing to 0 radians on the inscribed circle. It’s also equivalent to going from 0 radians to -2PI radians. Sines and cosines are periodic functions. They’re not necessary, but they make the programming easier. And I’m mapping the quadrants to the standard Cartesian quadrants because they make the math easier. The centre of the image should be the centre of the “circle” (or that small planet, as it’s affectionately known). So what did we get from our fisheye image? Let’s look at our results, shall we? First, let’s bring our source image back. The fisheye image I used is one of those where the bottom of the original landscape image is curled into the centre. The other type is where the top of the original image is curled into the centre. In that case, using the algorithm provided results in an upside-down image. I’ll leave it as an exercise to you for flipping the resulting image right-side-up. One note about the centre of the source image. I found that if the centre is off, the horizon of the resulting image won’t be flat. I’m just showing you how to get the landscape image from a “perfect” source fisheye image. I’ll leave the details of fixing missing corners and undulating horizons to you. P.S. A reader submitted this in a recent survey. I hope I’m interpreting the question and answering it correctly.